Luis Tyler, a small businessman from Orangeburg, S.C., needed a creative shipping solution for acquiring 55 pounds of a common agricultural product. So he asked that his vendor stuff it inside a Pac-Man arcade cabinet. Which the cops knew all about, of course. Tyler, according to the Orangeburg County Sheriff's Office, was busted by feds and local deputies on an undercover operation. 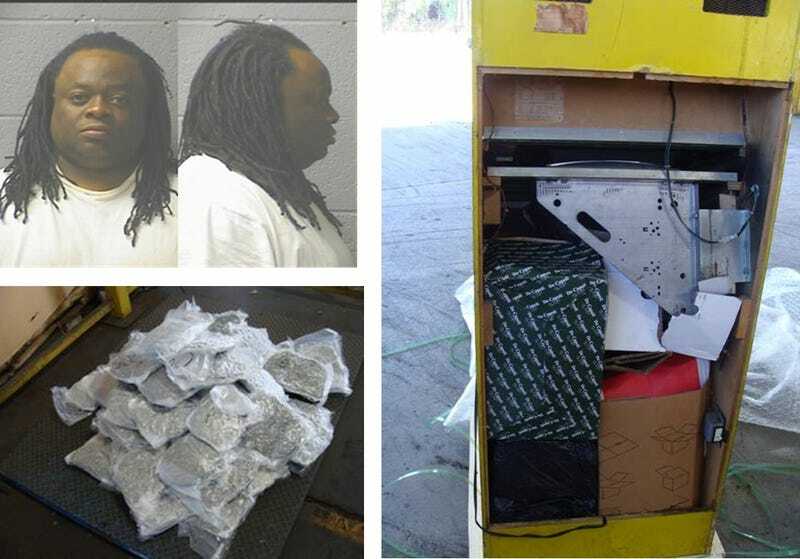 They saw him take delivery of a Pac-Man machine crammed full of marijuana and cuffed him on April 16. But Sheriff Leroy Ravenell is a witty guy. He waited until April 20—yessir, Four-Goddamn-Twenty—to announce the bust. And the irony doesn't stop there. "Our efforts to make Orangeburg safe will not stop," he said. "We are and will continue to investigate the criminals in our community and make arrests. You may be looking for a high score but what you'll get is game over!" Tyler is in the slammer with bond set at $75,000.